Good news! There is now a way to effectively combine and focus the energy of your crystals. Using a crystal grid, one that combines crystal energies within specific orders, forms, and structures will greatly expand the power and energy of your crystals in wonderful and highly effective ways. Like the difference between a single player on a football field and a full team in formation for a play, a crystal by itself certainly has energy and capability, but when a part of a well constructed grid its effects can be combined with those of others to create a much more powerful effect. This guide will explain the idea of Crystal Grids, show you how to use them, and introduce you to the the Grids sold here at Crystal Vaults. A crystal grid is an arrangement of crystals on a specific geometric shape that focuses the Universal Life Force in a particular way for a particular purpose. 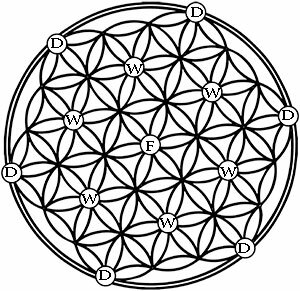 A crystal grid is a predefined set of multiple crystals arranged in a harmonic sacred geometric relationship. This combination and arrangement of crystals works synergistic to converts and focuses the external energy which impinges upon it in a variety of forms (e.g. sound, light, electromagnetism) into a unified energy field tuned to a particular need or requirement. The unified energy field that is created allows for vibrational interactions of crystal energies with the aura, spirit, and mind of the human body consistent with the prescribed healing and wellness design. Well, that is a long answer. Perhaps we shall just concentrate on the shorter one - a crystal grid is an arrangement of crystals on a specific geometric shape that focuses the Universal Life Force in a particular way for a particular purpose. As we mentioned earlier, a single crystal, properly prepared and used, can be a potent energy source for many purposes. However, sometimes you need more. Combining the power and energy of crystals can be confusing. Arrangements of crystals can be difficult to understand and use effectively. Crystal Grids solve these issues. If the grid is constructed correctly, you will be able to use its ability to focus and enhance the Universal Life Force easily and effectively. You will not have to worry about conflicting energies, or poor arrangements that dissipate the energies. Rather, you will use your crystals with confidence and power. Are Crystal Grids easy to use? The actual setting up of a Crystal Grid is extremely easy. It consists of a preprinted grid, a center crystal called a Focus Stone, a set of (usually six) Way Stones, and a set of (again, usually six) Destination Stones. All of the grids sold here at the Crystal Vaults come with a very detailed instruction sheet that both explains and illustrates the set up. It also explains the order in which the grid is constructed, and the exact way to use the grid. Every grid has several parts: The Focus Stone, The Way Stones, The Desire Stones, the Path, and the Visual. 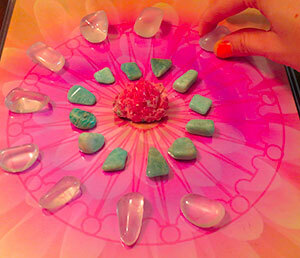 The Focus Stone is the rock or crystal that is located in the center of a Crystal Grid. Its purpose is primarily to gather, focus and amplify the Universal Life Force. It collects the Universal Life Force and channels it onto our grid. The Focus Stone is the part of our crystal grid that gathers in that Force, drawing it down and inward creating essentially a downward flowing wave of coherent energy that is then coalesced and amplified through the crystal’s internal energy lattice. The energy that flows out from the Focus Stone is then modified and shaped by the Color Energy of the Focus Stone and the design of the grid. The stones that immediately surround a center stone on The Path are called the Way Stones. They are very important elements of many grids. The Focus Stone brings in the Life Force and shapes it through its Crystal Energy Lattice, modifies it with its Color Energy, and sends it down The Path to the Way Stones. The Way Stones then further modify the energy. Their work is similar to a pump in a water system. The water is flowing down a pipe, but if a pump is added it can amplify and modify the flow. 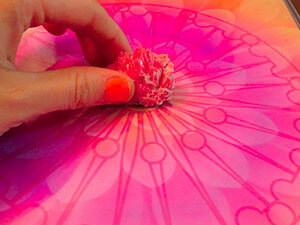 Way Stones do exactly that - they amplify and further modify the Universal Energy flowing in the Grid. Their effects, like that of a Focus Stone are dependent on their crystal energy lattice, and their Color Rays. Desire Stones are the outermost stones on a Crystal Grids. They represent the end state that the Grid is constructed to produce. Selection of Desire Stones is based on the specific final purpose of the Grid. These stones gather the energy that has been focused and shaped by the Focus Stone, the Way Stones and the Path. They give the Universal Life Force its final shaping and tuning to the desired outcome of the Crystal Grid. They are chosen in a similar manner to the Way Stones - by their Crystal Energy Lattice, and by their Color Rays. Desire Stones are often the crystals that would be used alone to accomplish something. However using multiple ones and having them fed with focused and amplified energy gives them much more energy to accomplish their purpose. The Path is the lines of energy that flow through the Grid guiding the energy from the Focus Stone, through any Way Stones, to our Desire Stones. The Path is the journey to the desire we seek. The Path is the energy conduit that draws on Sacred Geometry to align, transmit, and guide our energy to achieve our desires. The Path is the flow of energy in a particular grid design. The Path follows the lines of the Grid. It connects the stones to the Patterns of Life. There is a great synergy to be gained when the Path is aligned with the energy matrices of the crystals on it. The energy system that results is one of great power. The Universal Life Force is gathered, focused, and amplified effectively in a well design Crystal Grid with Paths that channel our energy effectively. The Path is derived from the grid shape. There are many designs for Crystal Grids. Each has specific uses and meanings. Circles, Squares, Triangles, Seeds of Life, Flower of Life, Hexagons, Pentagons, Spirals, Mandelas, the Borromean Rings, the Ashok Chakra, The Eye of Horus, and others are all potent and useful. Each has its specific meanings and power. The study of Sacred Geometry teaches the uses of each design. Our crystal grid are enriched by both design and color patterns. So all our grids should be built on a Visual. A grid designed to increase our health can be enhanced by a background scene of robust health and vigorous activities we desire when we achieve good health. A grid for increased wealth can be enhanced with a background of the money or the things we desire. The background gives form to our desire. All grids can be enhanced with a great visual. The visuals provided by the grid kits are great, but you can change them easily. 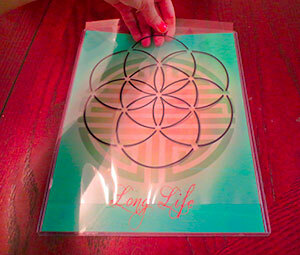 The visual is a print, and the gird overlay and the photo slide into a clear plastic protective sleeve. So you can reuse grid kits, and you can use your desires as the visuals. How do I use a Crystal Grid? Activating a grid is the most rewarding part of building and using a grid. The effect can be quite stunning and rewarding. At a time without distractions of any kind, take your wand in hand, stand or sit near your grid and close your eyes. In your mind, travel to the center of the galaxy. Feel the waves of energy washing over you as you get closer to the center. See stars and planets whiz by as you fly at incredible speed. When you get there, look around. Every thing in the Universe in spinning around you. Pulses of pure love and life energy are streaming out to the entire rotating galaxy. Hold up your wand and see the energy flowing out from it. Now in your mind’s eye look through all of space and find the Focus Stone of your grid. You will see it far out in the fringes of the Galaxy, but it is shining brighter than all the suns and stars. 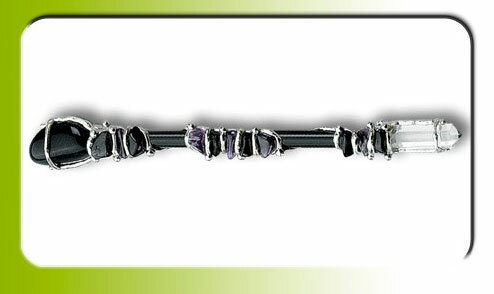 Use your wand to focus a flow of pulsing Life energies out to your Focus Stone. Now open your eyes to be instantly transported back to your gird. Wow, what a trip! Now touch your energized wand to the center of your forehead then touch the Focus Stone to seal the connection between your visions and the Focus Stone of your grid. Now the Universal Life Energy is flowing into your Focus Stone. As you do that see the pulsing, glowing energy pulsing outward down the Grid Paths to the Way stones, lighting them from within. See each of them in turn transform with an inner glow of pulsing energy. Then follow the energy down the Paths to the Desire Stones. See each of them start to have an inner fire. See the gird absorbing the energy of the cosmos through the Focus, travel the Paths into the Way Stones, and then lighting up your Desire Stones. See your grid light up in your mind’s eye Focus your being on your desire. Make it real. When this ritual is completed, your grid is aligned and alight with the Universal Life Force, Be aware that a grid can only be aligned by only one person or a group at a time. Your aligned grid will not help or affect others that come near it. If a grid is to help more than one person, all must participate in the alignment ritual. All of our Grids have instructions for their set up and daily use. 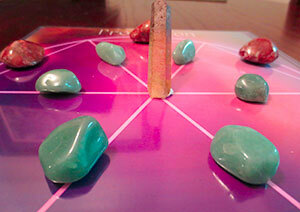 In general, you place a Crystal Grid in a location that is conducive to its use. Don't be limited. Grids work indoors and out. Grids are portable. Take them with you. Explose them to the Universal Life Force when possible. Use your imagination and get the most from your grids - they don't need just a single location. Experiment. All of the Grids in this book have instructions on their daily use. While the specifics of each grid differ, the concept is the same. Grids bring energy into a space and focus and align it to specific purposes. The energy from the grid has to go somewhere. Most grids are built to bring that energy into your life. To do so, you need to be in a receptive role. 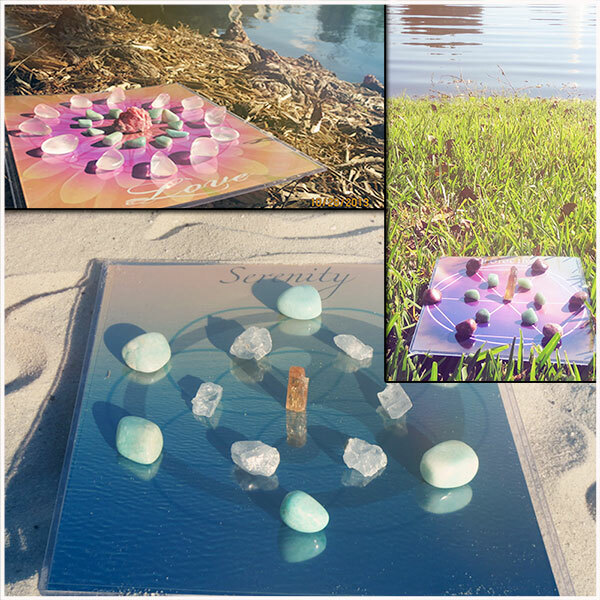 As you pass your grid during the day, stop and spend a few seconds absorbing the energy flow from your Desire Stones. The best was to do so is to first look at your Focus Stone. See a flow of energy descending into it like a pillar of light with the Focus Stone at the bottom. Then watch the energy flow down the Paths to the Way Stones. Look briefly at each in turn and focus on it for a few seconds. Remember what they mean. Then watch as the energy flows out to the Desire Stones. Let the energy from each one travel like a laser beam into your Third Eye Chakra. Absorb that energy and let it guide you closer to your desires. This visualization process will allow the Universal Life Force from your crystal grid to flow into your spirit and consciousness. It will empower you and show you the way to your desire. By itself a crystal grid is a powerful tool, but it a tool of self empowerment. You are the last part of the grid. So there you have it. Crystal Grids are potent ways to harness the Universal Life Force to accomplish your goals and live your dreams. Explore the many girds presented here at the Crystal Vaults. They are all designed and built based on sound research using the best possible materials. 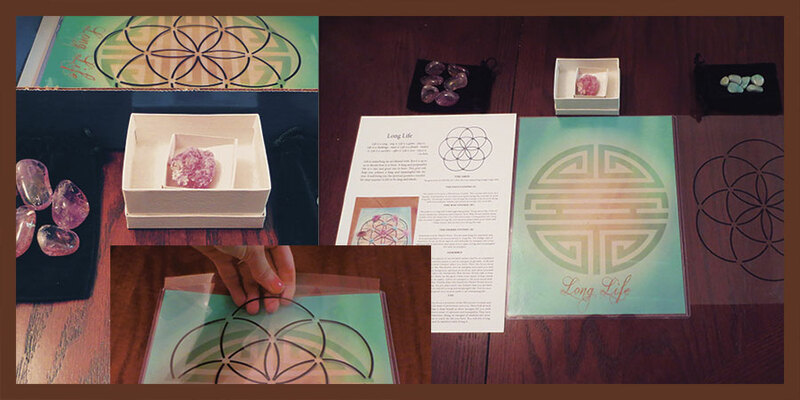 They all come with complete, detailed instructions and include all crystals, stones, visuals, and grids. CLICK HERE TO SEE ALL THE GRIDS - READY FOR USE. Extra stuff: OK, How do we know all this? The grids are based on several years of research in which we have learned many things. First of all, knowing which crystals to use and where to place them on a grid requires extensive knowledge of the energies of crystals. This knowledge is the knowledge of crystal energy matrices and the crystal color rays of influence. This research has been published for all to use. It can all be found in the book, The Seven Secrets of Crystal Talismans, by Henry Mason, published by Llewellyn in 2009 and available in a signed first edition here. It explains which crystals have the ability to focus energy for specific needs. Knowing when and how to use a Seeker, an Enhancer, a Barrier, a Dispeller, a Guardian, or an Attractor crystal is a key to successfully building an effective grid. Of course, every color of crystal will give a grid a certain energy, but as the wavelengths change, so will the energy the crystals add to the grid. To understand the individual colors to assure they interrelate effectively on a grid, we need to understand how the flow of colors around the color wheel reflect how life itself evolves and renews itself. Understanding the flow of the colors will show us which colors are needed for a particular grid application. We use the Color Wheel of Life to gain this fundamental understanding and assure our grids are built correctly. The Great Wheel of Life captures the natural progression of the colors, the progression of the seasons of the year, the daily cycle of the sun, the lifetime of a person, the times of the elements, the progression of the stars in the Zodiac, and the meanings of these times for grid uses. All the cycles are aligned and superimposed. 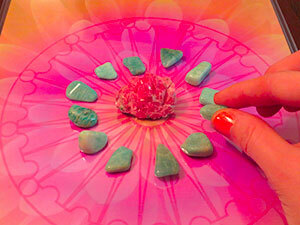 Use the Great Wheel of Life to find the right colored crystals for the time, phase, and purpose of your grids. We use the knowledge of the Great Wheel of Life explained in The Seven Secrets of Crystal Talismans to assure the effective uses and combinations of crystal colors on our grids. While mastery of Sacred Geometry can be a life long study, basically Sacred Geometry is the collection of ideas that seeks to understand the mind of our Creator through the geometry of Creation. Seekers of knowledge and wisdom about the Universe, and those that seek to guide and benefit from the Patterns of Life that exist in this Universe have turned to Sacred Geometry for insight and understanding. All of existence is built on a few fundamental design elements. Sacred Geometry teaches us that the seemingly endless, complex patterns of matter are all built on simple shapes of circles, squares, and triangles that when manifested in three dimensions produce spheres, cubes, tetrahedrons and other solid forms that are the building blocks of existence. The Platonic Solids, the three-dimensional manifestations of simple circles, squares, and triangles are the basic design of everything. They form us: the animals, the plants, the minerals of our world and the Universe. We humans, like the animals, plants, and minerals of our Earth, are all made of the same sub-sub atomic particles and energies that form the basic Cosmic Design. We are complex organisms, but we are built on a basic Patterns of Life and we are nurtured by the energy of the Universal Life Force. When we understand these Patterns of Life, we can apply that knowledge to combine and focus the unique energy of crystals by arranging the crystals using those patterns. Using crystal grids we can combine the power of the Patterns of Life with the specific energies of certain crystals in ways that expand, focus, align, and combine healing and spiritual energies. We can understand these patterns, and choose the correct ones for our needs by understanding and applying the ancient teachings of Sacred Geometry. There are many designs for Crystal Grids. Each has specific uses and meanings. Circles, Squares, Triangles, Seeds of Life, Flower of Life, Hexagons, Pentagons, Spirals, Mandalas, the Borromean Rings, the Ashok Chakra, The Eye of Horus, and others are all potent and useful. Each has its specific meanings and power. For example, when we seek fundamental desires and when we face fundamental questions, we must use Grids that are simple - powerful, and fundamental. Any grid that is focused on singularity, origin, unity, completeness, inclusion, and new beginnings can be based on a circle design. The Circle is the fundamental element of the Cosmic Design. Or when The Borromean Rings form the basis for our grids that accomplish efforts that require the efforts of groups to complete. The Circles bring the inclusion, and the overall design brings the synthesis of group dynamics and clarity of purpose to an effort. Or, if you need a grid to bring a group together to accomplish a goal or project, or you need a grid to bind a family together, one built on the Borromean Rings is a good basis. The Borromean Rings The Borromean Rings grid design brings us the power of the number Three. Three is the spiritual energy of intuition, magic and joy. It is the joining of Past, Present, and Future. Three is the symbol of success and reward. The number Three brings stability and balance. Three is the spiritual energy of intuition, magic and joy. It is the joining of Past, Present, and Future. Three is the symbol of success and reward. The number 3 brings stability and balance. This basic trefoil unit has been held sacred by many cultures. It is a representation of the second day of creation. It is powerful lens for representing many concepts including the Holy Trinity, Family, Life, Growth, and other elements of Creation. We use pentagon-based Crystal Grids for our needs that are associated with the plant and animal kingdom. They help bring life to gardens, increase the bounty of harvests, ward off diseases, protect plant life, and serve to focus and align the Universal Life Force for non-human life forms. So, circle, square, pentagon, seeds of life, Borromean ring, or any other design can be appropriate for a grid. Each design has its significance, its historic meanings, and its appropriate uses based on symbolism and geometry. All of the grids here at the Crystal Vaults are built on the appropriate design for the need. Finally, we have learned that to combine the crystals with the grid designs you have to have a deep understanding of the concepts for combining the crystals and patterns to create effective grid designs based on a particular, specific need. You need to be able to see the energy flows in the patterns, and you need to understand how the designs align and focus the many types of crystal energies. This knowledge is gained through combining the key energy characteristics of crystals with the meanings and design elements of the Patterns of Life. The combinations of grid structures and crystal energies, as we just mentioned, is a complex design effort, The knowledge needed to design an effective grid would fill a book. Actually that book is in the publishing process. In the meantime, you do not need the theory to put it into practice. You don’t have to be able to design an IPad to use it effectively and you don’t have to master all the theory to use your Grids.